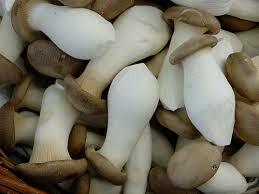 King Oyster Mushrooms are a beautiful mushroom with a unique taste and texture as well as impressive health benefits. King Oyster mushrooms have become very popular in gourmet restaurants due to their silky texture and elegant look: a long, wide stem and a large cap. All parts of this mushroom are edible. King Oyster is low in calories and rich in nutritional fibres.